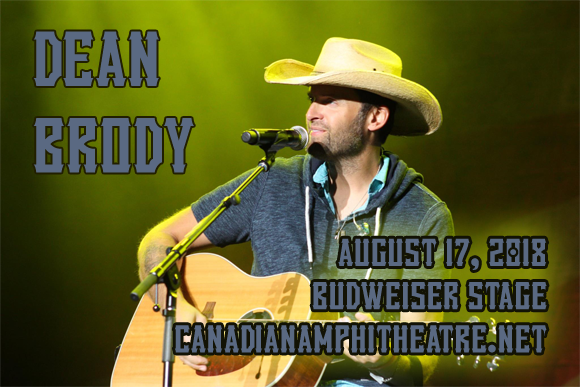 Canadian country star Dean Brody returns to Budweiser Stage on Friday 17th August 2018! Winner of sixteen Canadian Country Music Awards, Brody makes music that's influenced by a wide range of genres, but at it's core, it's all good ol' fashioned country! A natural performer, Brody knows how to get a crowd going! Be a part of that crowd and watch a master at work – tickets available now! Dean Brody is a Canadian country music artist, who made his debut on Broken Bow Records in 2008 with the single “Brothers”. The song was a US Top 40 country hit and became the first single from his self-titled debut album, released in 2009. After a move to Open Road Records in 2010, Brody released his follow-up, Trail of Life. His third studio album, Dirt, earned Brody the 2012 CCMA Album of the Year award and a 2013 Juno nomination for Country Album of the Year. He went on to win the 2012 and 2013 CCMA Male Artist of the Year award. To date, he has won sixteen Canadian Country Music Awards and two Juno awards, with his sixth studio album Beautiful Freakshow (2016) winning the 2018 Juno Award for Best Country Album.